Introducing our Lily Boho Capsleeve Maxi Dress, available in three gorgeous colours, Florence Green, Scarlet Red and Moonless Black. This striking maxi dress will be a classic Tulle and Batiste head-turner and sure to be your favourite this season. This stunning gown, in our lovely handmade print, is made from a super soft lightweight rayon and flows and ripples as you walk. 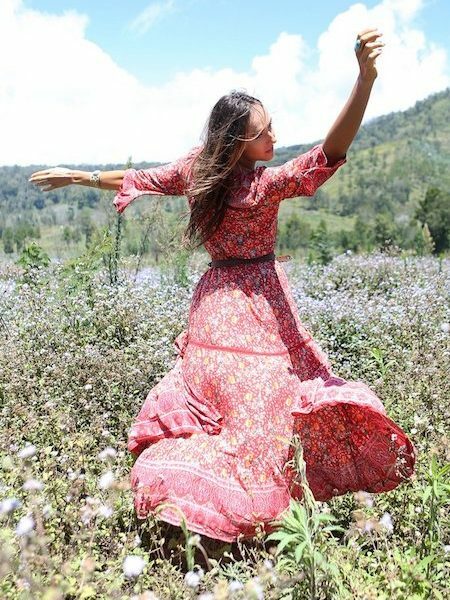 The Lily Boho Capsleeve Maxi Dress features beautiful capped sleeves and a neck tie with our signature wind chimes tassels. Pair it with our killer Eagle Boots and you will be dancing through your day and well into the night!